Knowing which sewing needle is needed for the fabric or project that you are working on can be overwhelming, especially if you are just starting out. The type of needle is important, because if you use the wrong needle you could damage your fabric. 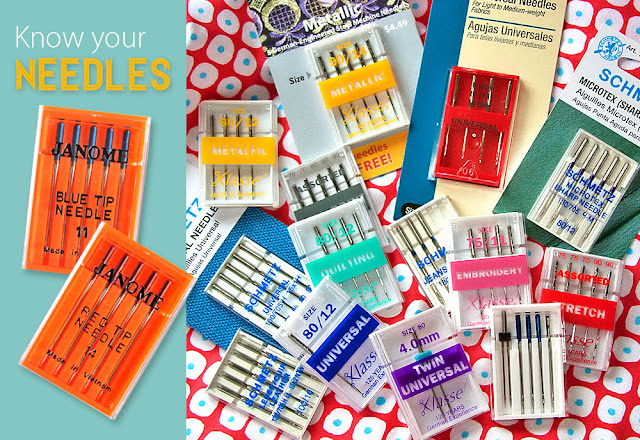 After this guide you will be able to tell which needle you will need for each project. Throughout this guide I will use the singer needles as examples. Wow, that is an intimidating chart. So lets break it down. First up is the Shank. The shank is the thickest part of the needle. It has a flat side on the back, and is rounded on the front. This is so that it can fit into out machine perfectly, and never be backwards. Second is the Point, which is located at the complete opposite end of the needle. The point is important because it is the first part of the needle that touches the fabric and can do the most damage. If you have a larger needle, it will make a bigger hole. See below for the correct point size for you fabric. Next is Shaft, which is the longest section of your needle, and holds other important aspects to the needle. The Eye of the needle is where you thread the needle. This part of the needle carries the thread to the bobbin casing and makes a stitch. The Groove of the needle can only be seen on the front of your needle. The Groove just leads into the eye of the needle. Last, but not least, is the Scarf. The Scarf is on the backside of the needle just above the eye. It allows the hook of the bobbin casing to get close to the eye of the needle to catch the thread and form the stitch. Next we will be talking about the colors and how they refer to your fabric. As shown above there are two colors on every sewing machine needle. The first color tells you what fabric type the needle is for. The second tells you the thickness of the fabric that is best suited for the needle. 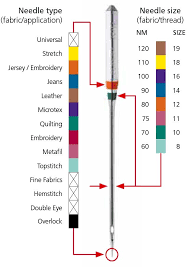 As stated above, the first color tells you what fabric type the needle is for. This is just the general category such as Universal, Jersey/Ballpoint, Stretch, Jeans/Denim, Microtex/Sharp, and Leather. 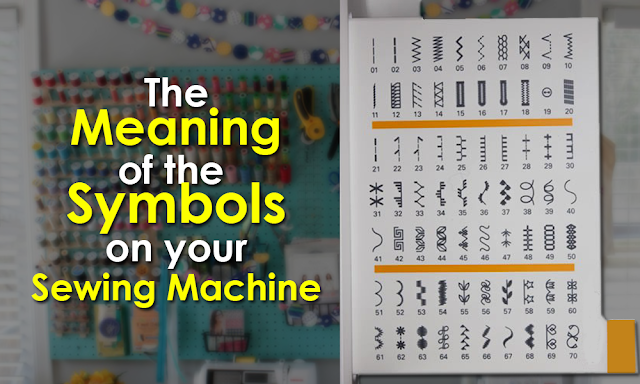 You can see in the picture above the 6 standard needle types with an extra type, the self-threading. The colors of the needle types are circled above, and are the colors of the written text below. The Universal, needle for pretty much anything, it is the standard machine needle that all sewing machines come with. This needle sometimes doesn’t have a color. If you are quilter then this needle is your best friend. Jersey/Ballpoint needles are used for knits and fabrics that have some stretch to them. The Stretch needles are more common than Jersey/Ballpoint needles. Stretch needles are used for knit fabrics of any assortment, that are super stretchy. Such as ribbed knits, jersey knits, and cotton knits. If you love sewing baby onsies then this needle is your best friend. Next up is the Jeans/Denim needle. This needle, as you can see above, is super sharp. This is for any of your woven fabrics such as, denim, suiting material, houndstooth, and other woven fabrics. The Microtex/Sharp needles are used for any of your “thin and lighter” fabrics. I say that lightly (no pun) because those describing words come more into play with the second color. But any way, this needle is used for your silks, coated fabrics, foils, polyester, and things of the like. Finally, the last needle that we will be talking about here is the Leather needle. This needle is the scariest looking of them all and is used for… you guessed it, Leathers! Now, out of all the needle types above, the two most common are the Universal, and Stretch. With the information below we will be using these two as examples. Just a pack of Universal/Embroidery Needles. There are three standard, second colors, that we will be talking about today. The Second Color tells you the thickness of the fabric that is best suited for the needle. If you look to the needle package above, the arrow shows which color we are referring to. 80/11, also known as the Orange size. is for lightweight fabrics. 90/14, also known as the Blue size, is for medium weight fabrics. 100/16, also known as the Purple size, if for heavy weight fabrics. First, a couple of things that you need to know about double and triple needles. Almost any machine can have a double needle used with it, but be warned if you machine doesn’t have a zig-zag foot then you are one of the few who cannot use them. This is because you will just break you needles when they try to go into your bobbin casing. Oh, and don’t be afraid when you look at the underside of the fabric, because there will be a zig-zag pattern, this is just a result of the bobbin catching both needles. The sizing of the needles refers to the distance between the two needles. The Twin, or Double needles are just two needles mounted on the same shaft, that creates two rows of stitches that parallel each other. 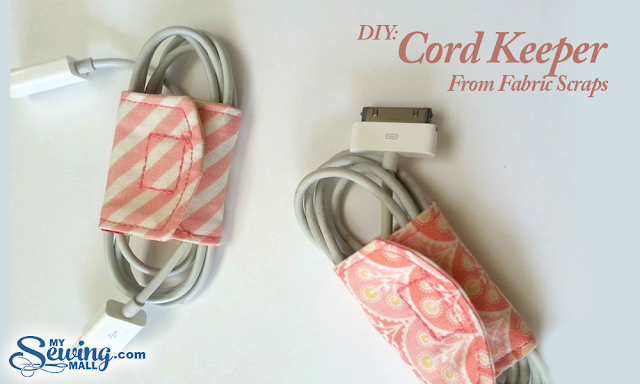 You would use two different spools on top, and just one bobbin underneath. There are several types of Double Needles. Each type referrers to the different types of needles that are paired together. Universal Twin – This is the typical type that you normally think of when you think of a double needle. It comes with many different sizes that are, again, based on how far apart the needles are from each other. Double Hemstitch – This double needle type uses a hemstitch needle along with a universal needle, with a 2.5mm separation. 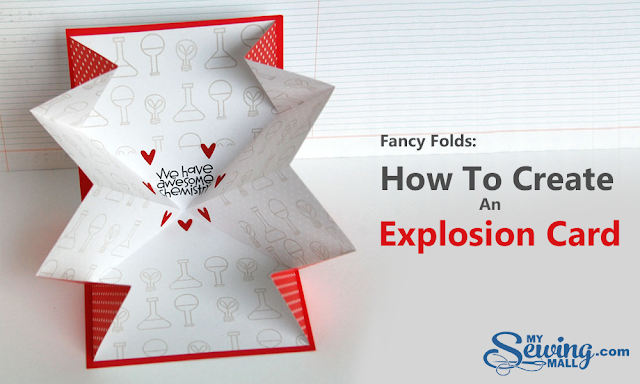 The Metallic Twin – This uses two metallic needles together. The Jeans Twin – This uses two of the Jeans needles together. The Stretch Twin – This uses two of the stretch needles together. Universal TRIPLE – This bad boy uses three, that’s right THREE universal needles together!